Dubya has to be the easiest guy in the world to loathe. On a good day he has all the brilliance of a cobweb dusted zero-watt bulb. His public addresses are a landmine field of bloopers, interspersed with flashes of breath-taking arrogance. He commandeered a war that torpedoed poverty-stricken nations, all the while killing his own soldiers in a fight that had no reason to be. It is safe, then, to say that George W Bush inspires about as much confidence in his abilities as Dr. Hannibal, the neurosurgeon. And the American people won't stand for it anymore. They deserve to know the truth about him and his scheming, conscience-free colleagues. And once the country's people are enlightened, they will rise as one, draw upon the awesome strength of democracy, and bring him back to power for the next four years. Watching Fahrenheit 9/11 after the 2004 American elections is strange. And a little frightening. Even after discounting for Michael Moore's obvious disgust and bitterness toward the Republican government, Fahrenheit 9/11 makes a powerful case against Bush Jr, using documented evidence and Britney Spears. Bush's presidential stint was tainted even before it began, and some people might take being pelted with eggs on your first day at the job as a fairly straightforward sign of disapproval. And according to Moore, things only got stinkier after that. Fahrenheit follows Bush's time in the spotlight, from the infamous Florida recount to the bitter remains of the War On Terror. Friends of the first family range from members of the Bin Laden clan to Kenneth 'Enron' Lay, and Bush seems to have anything but national interest in mind when he transports the first safely out of the country after 9/11 and hands the second a piece of the pie when it was time for Afghanistan to be rebuilt. The film follows in some detail the response of the government as it tries simultaneously to reassure its people and keep them safe, post the WTC attack. Disturbing facts about inadequate homeland security rise in the background as more and more young people are shipped off to fight the war in Iraq. Fahrenheit 9/11's most effective statement remains the one about regular people caught in the crossfire: people working in the Twin Towers, victims on ground zero in Iraq and Afghanistan, and American soldiers, who are stuck in the middle with defending a cause they don't recognize. Case in point: Lila Lipscomb, a mother who has her convictions brutally shaken when her son dies during combat at Karbala. The undiluted telling of her story, and that of many families in poor American suburbs, is one of Fahrenheit 9/11's most potent accomplishments. 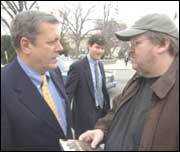 Fahrenheit 9/11 is also a bit of an entertainer. Not surprising since Bush Jr. is God's greatest gift to comedy, since Monica Lewinsky wore a blue dress. He (Bush) is not only unburdened with even an iota of grace, but also makes an excellent subject for Candid Camera. And things are not a lot better when the camera starts to roll either. So if you're here for the Dubya jokes, you will not be disappointed. But if you're looking for a starting platform to explore other questions, Fahrenheit 9/11 is your kind of 116 minutes. The quest is on, the truth is still out there. And Bush is back in the White House. God bless democracy. fullhyd.com has 700,000+ monthly visits. Tell Hyderabad what you feel about Fahrenheit 9/11!